People suffering from asthma or other chronic lung problems are typically only able to get a measure of their lung function at the doctor’s office a few times a year by blowing into a specialized piece of equipment. More frequent testing at home could detect problems earlier, potentially avoiding emergency room visits and hospitalization. A new tool from researchers at the University of Washington, UW Medicine and Seattle Children’s hospital lets people monitor their lung function at home or on the go simply by blowing into their smartphones. A paper presented this month at the Association for Computing Machinery’s International Conference on Ubiquitous Computing showed results that came within 5 percent of commercial devices, meaning it already meets the medical community’s standards for accuracy. A few existing smartphone apps claim to measure lung function, but they are poor mimics of an office test. For example, one app measures how loud the exhaled breath sounds, which strongly depends on how close to the mouth a person holds the phone. None of them is recommended for medical use. Home testing systems are now becoming available, but they cost at least a few hundred dollars, can be difficult to use, and patients have to have the equipment with them to take a test. 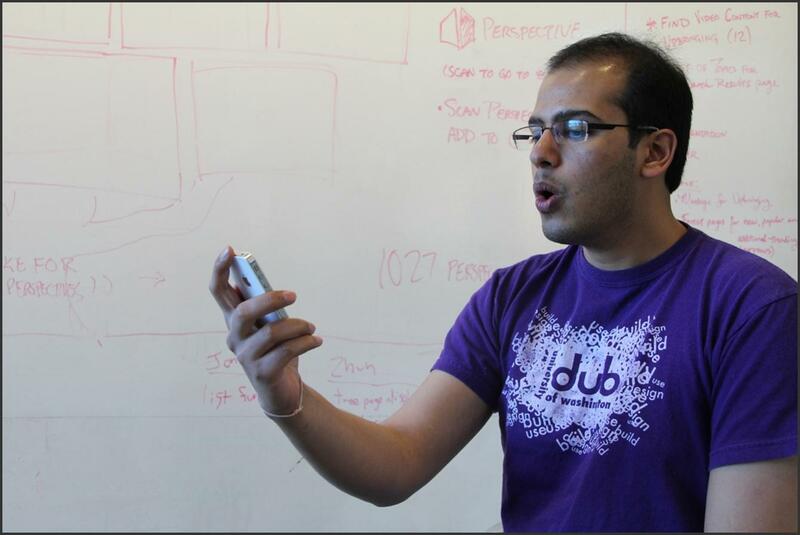 Last year Patel’s group used a smartphone to track a person’s coughs throughout the day. Now his graduate students Eric Larson in electrical engineering and Mayank Goel in computer science and engineering have led a 2.5-year project tackling the harder problem of how to get an accurate measure of lung function using nothing but a smartphone. Existing spirometers have patients with chronic lung ailments such as asthma, cystic fibrosis and chronic bronchitis blow into a tube with a small turbine that measures the speed of the flow. Patients take a deep breath in, then exhale as hard and fast as they can until they can’t blow any more. The spirometer measures how much and how fast the person can breathe out, which tells doctors whether their airways are narrowed or filled with mucous. The UW researchers found they could model a person’s trachea and vocal tract as a system of tubes to replace the spirometer, and use a phone to analyze the sound wave frequencies to detect when the breath is resonating in those natural pipes. “There are resonances that occur in the signal that tells you about how much flow is going through the trachea and the vocal tract, and that’s precisely the quantity that a clinician needs to know,” Patel said. 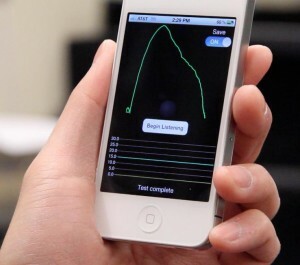 Researchers tested the system on 52 mostly healthy volunteers using an iPhone 4S smartphone and its built-in microphone. Results showed that the UW research app, SpiroSmart, came within 5.1 percent of a commercial portable spirometer that costs thousands of dollars. Natural variation in how much effort a patient uses to exhale during each test means that about a 3 percent variation is unavoidable. “The tests are very promising,” said co-author Dr. Margaret Rosenfeld, an associate professor at UW Medicine and a pulmonary specialist at Seattle Children’s Hospital. “Both providers and patients are very excited” about the possibility of home tests, she added. A grant from the Coulter Foundation will fund more clinical testing with patients of varying ages and lung health, and help the team to seek Food and Drug Administration approval. The researchers are working with the UW’s Center for Commercialization to bring the technology to market. Other co-authors are Gaetano Borriello, a UW professor of computer science and engineering, and Sonya Heltsche, a biostatistician at Seattle Children’s hospital. For more information, contact Patel at 206-543-3451 or shwetak@cs.washington.edu and Rosenfeld at 206-987-6547 or mrosen@uw.edu.